A study looking at the latest innovation of consolidating lung cancer surgeries by location in Kaiser Permanente Northern California showed regionalizing these procedures was feasible for the organization and effective for patients, resulting in shorter hospital stays and fewer complications. Kaiser Permanente regionalized thoracic surgery in 2014, shifting cases from 16 medical centers to 5 designated Centers of Excellence. Jeffrey B. Velotta, MD, a thoracic surgeon with The Permanente Medical Group, examined data of surgeries done before the regionalization (from 2011 and 2013) to those done after (2015-2017). 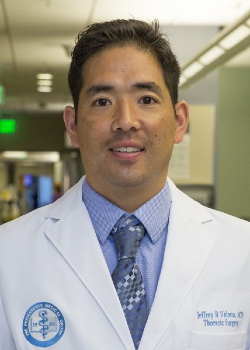 He and the study’s co-authors presented their findings this week at the 55th Annual Meeting of The Society of Thoracic Surgeons in San Diego. The study, conducted with Sora Ely, MD, of the UCSF East Bay Surgery Program, demonstrated that patients having surgery after the regionalization spent less time in the intensive care unit and were able to leave the hospital sooner. They also had fewer major complications than patients who had surgery before the regionalization (9.6 percent vs. 13.6 percent, respectively). By focusing the surgeries in fewer facilities, efficiency and performance were improved by the higher volume done by surgeons. The study also found that most of the surgeries done after regionalization were using the minimally invasive video-assisted thoracoscopic surgery (VATS). “The cardiothoracic surgery community seems to be moving toward the VATS approach for major pulmonary resections as the standard of care for patients who are candidates,” Dr. Velotta said. You can read the full announcement of the study on the Society of Thoracic Surgeons’ site.